Book a ferry to Ibiza with AFerry. 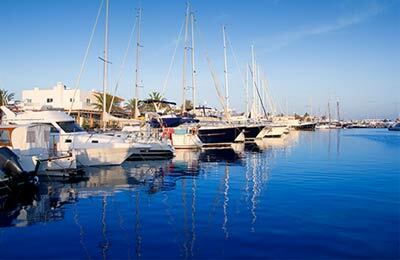 You can use Ibiza to take ferries around the Balearics and also to Spain. 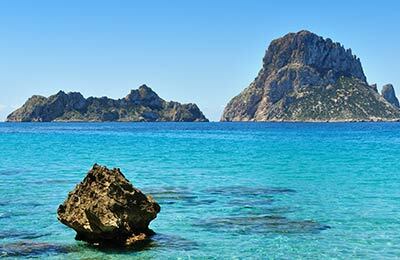 Domestic services in the Balearics are available from Ibiza to Formentera and Palma while ferries away from the Balearics sail to Barcelona, Denia and Valencia. Ferries to and from Ibiza are operated by Aquabus Ferry Boats, Balearia, Mediterranea Pitiusas, Trasmapi and Trasmediterranea. Because 5 ferry companies operate in and out of Ibiza, comparing can be very useful to help you find the best price at the best time for you. When you search for a ferry to Ibiza, we will always show a range of times just in case it's cheaper earlier or later than the time you select. We'll also show you results for similar ports like San Antonio to help you find the best times and prices to suit your plans. Ferries with Aquabus Ferry Boats and other companies operating to and from Ibiza are known for their comfort and high levels of service, and you will feel like your holiday has begun the moment you step on board. Travelling to Ibiza will be easy and hassle free. Start by making your booking today, it's quick and easy. I had the misfortune to travel on the first day of a change of dock for the boat. Unfortunately the check in staff advised me to go to the old boarding gate not the new one two miles away. We were then escorted in convoy through Barcelona to the boat another two miles away. Crazy. When you have no Spanish that makes life difficult. On our return the boat docked at the new terminal so I assume things will be a bit better now. This is basically a freight boat that takes some cars. Ok and functional but basic. I paid about £190 for a return ticket for 4 of us from Palma to Ibiza and I think that is great value for money. The online booking and the further check in at the port were all smooth. I would definitely recommend aferry for your cruise or ferry bookings.